stabilizing muscles of the core. Cycling can be done in gym and road as well.The repetitive knee motion, without constant impact, is especially good for arthritic knees because it encourages the production and flushing of fluids through the joint, lubricating it and washing away waste products. You can also do backward pedaling. It is beneficial and effective is for those enduring meniscal problems or tibiofemoral osteoarthritis. Backward pedaling acts to reduce the pressure on the tibiofemoral joint so using backward pedaling on a bike connected to a turbo trainer or a stationary bike can be added to a safe rehabilitation programmer. saddle position, fore aft saddle position, saddle tilt, cleat position and overall bike fit are a major contributor to knee pain cycling. Like any sport warming up is crucial, you can’t just get on the bike and hammer. Focusing on proper pedaling technique will put less stress on your knees. If you clip in (as long as you have sufficient float) can help muscle imbalance and proper knee alignment. Do not overdo it, make sure to only increase duration, frequency or intensity a maximum of 10% per week. 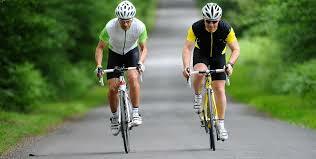 Too many cyclists do not listen to their body if you feel pain stop! Don’t push through it. Figure out what is bothering your knee and fix it.